A feet-first introduction: Meet Visionaire, trained by Michael Matz. He's wearing a Kerckhaert aluminum race plate, imported from Holland. Visionaire's farrier is Todd Boston. One shoe is worth a thousand words for Kentucky's Colonel: Look at this shoe shape. It's the "Fast Break" raceplate from Kerckhaert, also imported from Holland. Notice how broad the toe bend is. Colonel John is owned by WinStar Farm and trained by Irishman Eoin Harty. His farrier is Steve Norman. Blog readers must wonder if there are other horses entered in Saturday's Kentucky Derby besides Pyro and Big Brown. The blog has focused on the special footwear worn by those two...but the other 18 horses have feet and some special shoes, too! Our friend Dan Burke of Farrier Product Distribution (FPD) must have some sort of a VIP backstage pass at the Derby. He seems to show up at the stakes barn every year and usually has some great photos to share. Thanks to Dan for sharing these photos. I guess it is no coincidence that these two horses are wearing Kerckhaert plates, as was War Emblem a few years ago. Dan's company imports Kerckhaert shoes to the USA. Thanks, Dan! PS For all the racing people checking in to this blog, especially the ones referred by the New York Times (thank you! ): Look at these feet and you will see why we put so much store in the size, shape, and fine points of a horse's hooves. You can easily see that the frog (triangular tissue protruding on base of foot) is very different in each horse, as is the shape of the foot. There are always differences between front and hind shapes, and often between left and right, on the same horse, but the difference from horse to horse may not be obvious until you see two photos together, as we are showing you here. Unfortunately, the horse with the best feet is often not the fastest, or else we'd have cleaned up at the betting window years ago. However, the horses with better feet stand a chance of racing longer and staying sounder. If you are going to race a gelding, you want him to have great feet! Big Brown's left front foot has a raceplate glued on with a PMMA epoxy type adhesive that is custom selected. The specs used are Lord 403 with a #19 accelerator. You can see a copper "clip" embedded in the glue; it is riveted to the shoe and is used only as a receptor for additional glue. The horse had wall separations on both front feet that required repair. Racing fans, rejoice! I have finally obtained actual close-up photos of the feet of Kentucky Derby favorite Big Brown. The following photos were taken on or about April 11, 2008, when the horse's feet were re-glued and re-shod by farrier and hoof repair expert Tom Curl of Vero Beach, who has been working on the colt since he shipped to Florida this winter. I know there has been some confusion and misinformation in the press so to clarify: the colt was originally worked on by Ian McKinlay in New York, and the horse benefited from his new Yasha shoe technology and heel resection technique. Ian has been supplying photos and videos of the technique and system. But the horse subsequently was worked on by Tom Curl, an associate of Ian's. Tom did the work on the second foot. What you see is a collaborative effort of two experts using a new technology that has been helping a lot of horses over the past few months. This is the bottom of the foot, showing the placement of the clips. The shoe has a rubber-like gasket rim pad on the inside that is half the web of the shoe. Adhesive is under the other half of the web. 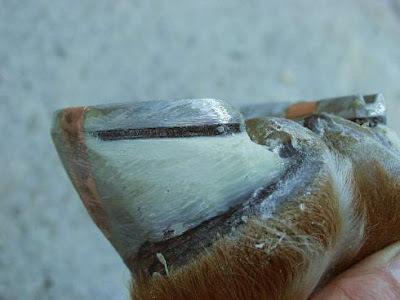 This is a unique modification of the "direct glue" technique used by farriers. This foot shows the repair situation on the inside heel of the first foot, which was done by McKinlay in New York. You can see that the new heel wall is growing down. Here's the foot worked on in Florida by Curl, showing the heel repair on the right side of the photo. The glue on the left side is just for reinforcing the shoe. Here are both of Big Brown's feet as he looked on April 11. Tom said that he used more glue than McKinlay because he knows the Derby will fall three weeks after the horse was done, and the glue can be stressed over time, so he was pro-active. Here's Tom Curl checking out Big Brown's hind feet; he said that they are turndowns (bent heels for traction) appropriate for Churchill Downs. Read more about Tom Curl and Big Brown in an article in today's Treasure Coast Palm (Florida) newspaper. HoofTech's Custom Engineering: The Shape of Things to Come? There's plenty new under the sun these days. 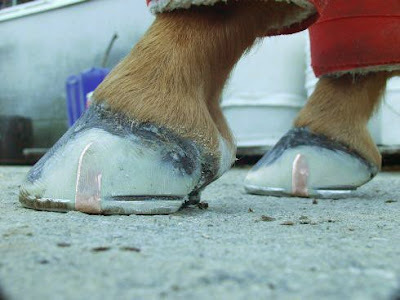 Consider a new line of 3-d hoof appliances (dare we call them mere "horseshoes"?) from HoofTech, a computerized-design lab for horseshoe applications in California. The metallurgy specialty for this company is application of high-tech aircraft-grade aluminum alloys for support shoes, especially exaggerated wedges, like a thick, curvy 5-degree aluminum wedge shoe, or this four-cornered heart bar. HoofTech encourages customers to place orders for custom shoes, made to specification in pairs. You could call this service "custom engineering" of your own line of nailable or glueable shoes. Who knows? Maybe that 4.25-degree wedge with a 3-d bar and rolled toe you've been drawing on napkins will soon be on its way to you...by the case! High-tech HoofTech shoes are in use on the West Coast and headed your way this spring. According to the company, they've had terrific success with Quarter horses and have already notched their belt with a championship. I'm looking forward to seeing these shoes on a horse! I didn't ask if they can be made with a belly, but it seems like computerized milling stations can create almost anything. Maybe someday instead of forging contests, farriers will have milling station design challenge contests. 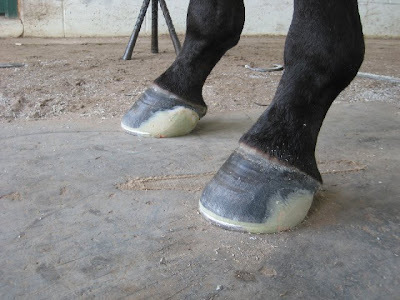 These shoes could also become support bases for hoof boots to make an elevated appliance for a tendon injury or post-surgery, for instance, instead of a patten bar. Has anyone out there tried these? DSC_0951kopie, originally uploaded by Ton van der Weerden. Something about this photo just spoke to me. Hint: it wasn't the flies. Thanks to Ton van der Weerden for seeing things from my point of view! Note: If you click (or double-click, as your browser prefers) you can see the entire photo. For some reason, the blog window is cropping off the righthand portion of the photo. Ok, racing fans! Things are coming together now! Unless this video crashes the blog once and for all, here is a complete video showing Ian McKinlay's procedure for reconstructing a blown heel quarter / subsolar abscess in a Thoroughbred racehorse. This is very similar to the procedure he used on Big Brown, Richard Dutrow's colt favored in next week's Kentucky Derby. The second part of this video shows a top Standarbred with a similar problem. You will also see a lot of detail on the shoe and Ian has provided a voiceover to explain what he's trying to do. Assembling this information has been a work in progress, but this video puts it all together. Previous posts from this week and last week (scroll down the blog to read more) included a video of quarter cracks, the difference between quarter cracks and wall separations, glue-on shoes worn by Kentucky Derby contenders, and the direct rim glue application technique with copper clips and heel cushions. Thanks again to Ian McKinlay, along with Conny Svensson, Jimmy Takter, and Richard Dutrow, and to Big Brown's owners, IEAH, for working with us to provide this information that may be helpful to other horses. The end of the video has a link to the Tenderhoof web site, which has not gone live yet, so save that URL for future reference. This video is not an advertisement for any commercial product; Hoofcare and Lameness has no business arrangement with the shoe or the new company. 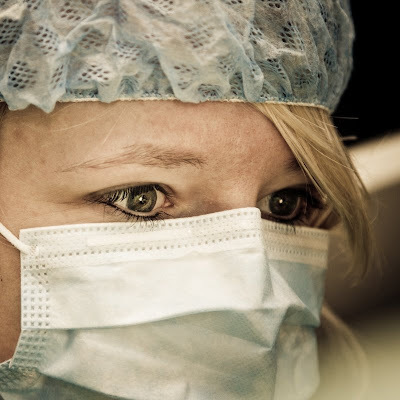 This is provided for educational purposes and to hear feedback from other professionals. Disclaimer: Obviously, Ian McKinlay is a highly skilled hoof repair and quarter crack specialist. That is all he does and he works as a consultant to the trainer, supplementing the work of the regular horseshoer and veterinarian. This is NOT a how-to video. Also, the problems of these racehorses are well documented, as Ian mentions, and very common. You would probably not see these problems in horses competing at other sports, and if you did, the recommended solution might be very different. Those horses might enjoy the luxury of a layup. Racehorses have work to do. All HoofBlog text and images © Hoofcare Publishing 2008 unless otherwise noted. Video courtesy of Ian McKinlay. The Serbs Are Coming! Will British Farriery Standards Be Threatened by "Guest" Farriers from Continent? "The Serbs are coming! The Serbs are coming!" Today is Patriot's Day here in my state of Massachusetts. I think that the Boston Marathon has a lot to do with why everyone gets the day off (it would be physically impossible to drive from point a to point b because of road closures and chaotic traffic, not to mention runners) but the true meaning of the holiday harkens back to 1775. On that first Patriot's Day, Paul Revere galloped out of the city (not following the marathon route) to the villages, shouting as he went, "The British are coming! the British are coming!" True to form, the British were marching out of the Boston barracks to destroy a munitions garrison in the little farming village of Concord. The American colonists stopped the Brits at a tiny bridge over the Concord River and thus was fired "The Shot Heard Round the World" and the American Revolution began. The Redcoats had to high-tail it back to Boston, and the rag-tag colonists chased them. How appropriate that the headline story in today's Horse and Hound newsmagazine from London should be the gloom and doom of the world's last great traditional system of farrier education and licensing, a.k.a. "British Farriery". First we saw holes poked in the British farrier system, as documented on this blog, as the British animal welfare authorities recognized barefoot hoof trimmers as a legitimate caregiver, as long as they did not attempt to nail on shoes. According to the new directive it will be ok to give them rasps, give them nippers, give them hoof knives...just don't give them a hammer and tongs. Don't let them play in the fire, whatever you do. And now today's news. For weeks we have been reading on farrier forums about the specter of Britain opening its doors in compliance with European Union regulations, which state (fairly or unfairly) that "guest" farriers from EU member nations must be allowed to shoe horses on British soil. 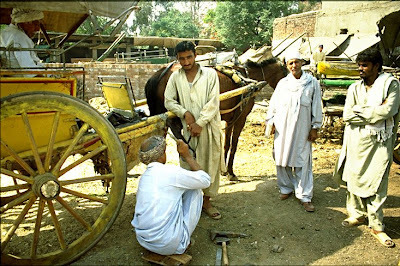 For years, the Farrier Registration Council (FRC) has used its regulatory powers to keep the local gypsies from shoeing other than their own horses. Even American farriers and veterinarians had to get a waiver from the FRC to shoe a horse in a competition, for instance. And now it will be open doors. Will this be the end of Britain's revered system? Most definitely not, is my guess. If the system is all it is cracked up to be, "guest" farriers may come in with their polo ponies or their show jumpers, but they won't be sticking around unless they are prepared to shoe to a standard that owners and trainers expect and demand. The feared invasion of eastern European farriers may be all an imaginary one. Headlines like today's make me miss icons like the late Edgar Stern, head of the venerable Kent dynasty of farriers, who died a few years ago. In my vision, Edgar would have stood, feet firmly planted, atop the white cliffs of Dover. "Come on, then!" Edgar would have said. He'd soon be giving English lessons around the teapot in his forge...and signing up some Romanian first-year apprentices. The challenge for the Brits is not to keep the Euros out, but to export their own knowledge and know-how, if not their regimental system, to the have-nots and the hungry of the farrier world. When that day comes, it will be a better place for horses and all. Let the reverse migration begin...and someone can shout, "The British are coming!" in a Slavic dialect. Kentucky Derby favorite Big Brown is the subject of a lengthy article in today's New York Times. But most of the story is about his feet, and his glue-on shoes. Another Derby favorite, Pyro, has also been training and racing in glue-on shoes. The last time I can remember horseshoes being so prominently featured in the Times was 1996, when Kentucky farrier Steve Norman worked with Derby favorite Unbridled Song, and helped him prep for the Derby, and race, wearing a variety of bar shoes. 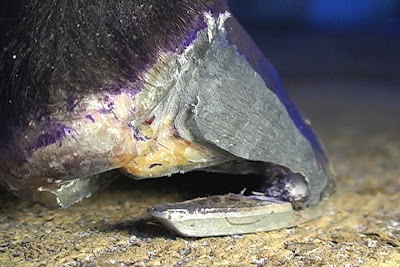 Last week we showed you Ian McKinlay's video clip of a quarter crack, and tried to paraphrase Ian's description of the various types of "blowouts" that can fracture a racehorse's hoof wall, and showed a foot with a wall separation ready for repair. That photo showed a foot that might look something like what Kentucky Derby favorite Big Brown's feet looked like when his injuries occurred. 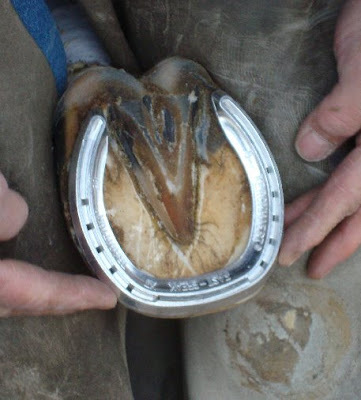 They have now been repaired and the horse's trainer, Richard Dutrow, commented to the press today that he is pleased with the condition of his horse's feet and the recovery that has been made possible by a combination of hoof repair and cushioning of the injured area, coupled with glued on "gasket" shoes. 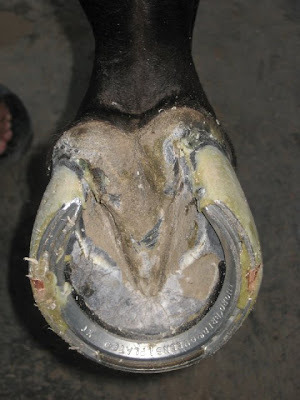 The shoe design and rationale has already been explained in previous posts but this serious of photos will show you a horse that is NOT BIG BROWN, but that received a similar shoeing solution. Ian McKinlay has provided these additional photos to give people a broader view of how streamlined and non-intrusive the repair process is, compared to the older ways of bar shoes and laced and layered patches. A blog comment last week brought up a good question, regarding his ignornance that Pyro had won his two previous starts wearing glued-on shoes. A few years ago this might have been a handicap, but that racing observer wondered if shoes shouldn't be disclosed to the betting public because high-tech enhancements might offer an advantage to a horse, similar to the new Speedo "skin suits" with ultrasonic welds instead of seams, which will be used in the 2008 Olympic swimming competitions. That is, unless they are ruled to be performance-enhancing equipment. The shoe (race plate) package ready for application. The heels are fully cushioned where the wall has been removed. The copper "clips" are not clips in the sense of those used on steel shoes; they are providing more surface area for the adhesive. They are just thin tab-like strips of copper. Remember that this shoe will be glued on, there is no issue with nails having to penetrate the rubber. The heel is rebuilt and the shoe is on. The temptation is probably to incorporate the heel repair into the shoe but the two have to maintain separate entities so that the shoe can be removed. The artificial heel will be trimmed as it grows down. Only the copper tab crosses the frontier between the shoe and the real/artificial wall. Remember that the padding under the heel is the full width of the shoe only in the heel area, which is why you see the black line fill with adhesive in the quarter. 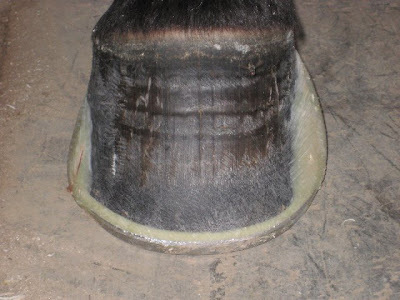 I am not sure whether or not this horse had blowouts (wall separations) in both heels, possibly caused by subsolar abscesses, hard racetracks, or gait changes, so both heel walls were trimmed out and replaced with artificial wall. 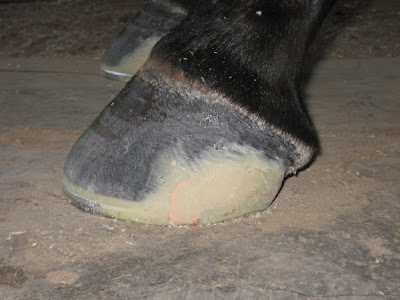 It's also possible that the the adhesive and heel cushion were used on both heels to provide symmetrical heel architecture and encourage normal gaits and stride characteristics. The finished feet. This horse will have the benefit of pain relief from the cushioning and the realigned support of the artificial heel wall to stabilize weightbearing over the entire foot (or where the foot would be). This procedure hopefully encourages normal circulation and a normal gait pattern. The finished job does not look very different from a patch for a quarter crack or a wall rebuild for a thin-walled horse so you can see why a trainer would just refer to the injury as a "quarter crack". Thanks to Ian McKinlay for sharing this technique, and for interrupting his work to take these photos. Racetrack repair technology is continuing to evolve as more horses are being shod and supported as their needs dictate. Ian is a career specialist in quarter crack repair and is bringing new ideas and materials to the racetrack to help horses stay in training. He is very generous to share information from the racetrack with the world through this blog. Click here for interview with Big Brown trainer Richard Dutrow about the horse's feet. The Olympic Torch kept winding its way around the world this week. Protests in India and Thailand were in the news but, closer to home, some equestrian news stole the Olympic spotlight. As you may have heard by now, the city of Chicago, Illinois is vying to be the host city for the 2016 Summer Olympic Games. Sounds great, doesn’t it? The Olympics in Wrigley Field? But where would the equestrian sports be hosted in the Windy City? Today we found out. Chicago 2016, the organization bidding for the privilege to host the Olympic and Paralympic Games, announced today that Tempel Farms in Lake County, Illinois, will be the proposed site for the Olympic Equestrian Complex. Tempel Farms' participation is expected to strengthen Chicago’s concept for the Games significantly. Background: Tempel Farms was founded in 1959 by the late Tempel and Esther Smith and is home to the largest privately-owned herd of Lipizzan horses in the world. Over the years, Tempel Farms has hosted many equestrian events including the North American Young Rider Championships and the United States Dressage Federation Young Rider Clinic Series. The farm’s area is large enough to accommodate spectators and officials comfortably. In addition, the possibility of establishing an equine veterinary clinic after the Games works cohesively with Chicago 2016’s interest in leaving a positive legacy for future generations to enjoy. Tempel Farms’ offer will improve Chicago’s initial proposal because the critical cross country course already exists. News source: www.aroundtherings.com, the subscription-based Olympics news service. A wild horse pen in the Australian bush. Researcher Brian Hampson at the University of Queensland in Australia is in pursuit of two lofty goals: a solid database of information about the hooves of “brumby” wild horses and a PhD on the topic of "Improving the foot health of the domestic horse". Australians are known for their relentless pursuit of goals, as illustrated in that most classic of all horse films, The Man from Snowy River. In that film, we saw a foreshadowing of things to come, as the real-life contemporary Australians established global dominance in the sport of eventing. The riding in that film was so good, it seemed like any number of the cast could have been members of the Australian Olympic team picking up some extra cash. Pollitt and Hampson are more likely to be pursuing their brumbies from a helicopter than on horseback, but both are more than capable of stepping in as rider extras in the next Australian horse film classic. Pollitt’s equestrian accomplishments include a national heavyweight championship in endurance and Brian competes in cattle working horse events and trains horses when he’s not in the research lab. “I will be going bush in a few weeks,” writes Brian in an email today. I think that means that he will head into the wilds to check on the "mob" of wild horses outfitted with GPS sensor collars. The foot research group is studying how much movement wild horses do in a day, in what direction, over what terrain and what changes show up in their feet. The project also have video cameras mounted at watering holes to see how much immersion the feet typically experience. The horses are in an exceptionally dry area with access to two watering points. Each sensory-equipped brumby is funded by a sponsor, including one that originated from the introductory post on this blog. Thank you very much to that donor…whoever you are! It is not too late to become involved in this project and help Dr Pollitt and Brian reach their goals. The cost is approximately $2600 per horse. Click here to read the original post about the brumby hoof study. Click here to visit Dr. Pollitt's Australian Equine Laminitis Research Unit's in-depth web site. "You can bid the mob good day": This short clip from the film "The Man From Snowy River" is on everyone's favorite lists for capturing amazing horsemanship (and horses) on film. For a lot of people, this is the ultimate wild horse image. At some special fundraising events for laminitis research, Dr. Pollitt recites the original Banjo Patterson poem on which the movie is based. He wears his Akubra hat and cracks an authentic kangaroo-hide stock whip for punctuation. Can you find the white horse on the Google Map? This is an image of the little town in Wiltshire, England where an ancient outline of a white horse is carved in the hillside; it was captured before the enhancement described in this story. If you are new to Google Maps: Use the directional buttons on the map to move around; use the plus/minus symbols to enlarge/reduce your view. Hint: the white horse is just above the edge of the bordered tilled fields, at the upper center of the photo. If you put the mouse arrow over that spec and hit the "plus" symbol, the horse should come into view. Keep trying, you'll get the hang of it! You should also be able to navigate around the image by holding down your mouse button and dragging across the image. The little "pins" in the map indicate Google advertisers. They're everywhere. Have you always wanted to visit Stonehenge? Think crop circles are more interesting than "American Idol"? Fancy you'd look great in a hooded cape? Then you probably know all about the white horses that dot the remote countryside hillsides of southern England. Some of the "chalk horses" trace their origins to prehistoric times. But one has been in the news lately. The hillside horse above Alton Barnes in Wiltshire was enhanced recently when a creative landscape artist added an anatomical detail to the horse. Motorists on the motorway glanced up and said, "I've been driving down this road for years and never noticed it was a stallion before." Well, it wasn't a stallion before. So far, apparently, no one has climbed up there (this is a steep hillside) to find out if the change is merely artistic or if the ground has been excavated down to the chalk. Apparently once in the past, it was temporarily turned into a zebra. And (I would love to see this) on the summer solstice, the entire horse is outlined by candles--placed there by chanting Druids, no doubt. Here's a Scrabble word for you. The art and science of carving horses into hillsides is known as "leucippotomy". I guess that means that Alton Barnes has a lewd leucippotomist...on the loose. Thanks to Horse and Hound, the BBC, and a lot of rather strange but helpful cultish web sites for assistance in assembling this post. I found out that Alton Barnes has crop circles, too, and that the chalk horse there is one of the newest; it was carved in 1812. Friends at Work: How Many Guys Does It Take to Shoe a Horse? Some things are the same the world over. People hear that tap-tap-tap of the farrier's hammer and it's like a call to meeting, no matter where you are. In this case, "we" are in Punjab, one of the four states of Pakistan. Here's the worldwide formula: One guy has to own a horse. It takes two (at least ) to do the work. And two to stand around giving a running commentary. Meanwhile, in the capital city of Islamabad, the Olympic torch was passing through...in a horsedrawn wagon. Perhaps the runners were exhausted...and maybe this fellow in the cart was on his way there! Photo courtesy of Yvonne Stepanow and Stock Exchange photo agency. Note: “Friends At Work” is a regular feature of the Hoof Blog. When newspapers and web sites alert us to features on our hard-working readers and farflung friends, I sometimes can figure out how to link to the story and share the photo with blog readers. Preference is given to people who aren’t normally in the news…and the more exotic the locale, the better! Scroll down the blog to read more "Friends at Work" posts from all over the world. You could be next! "The First Saturday in May" Will Be on the Third Friday in April! See you there! Click on the "play" icon to launch the movie trailer. Turn up the volume! Something special is coming to a theater (possibly) near you on Friday, April 18th. That's the date of the premier of the exciting new documentary "First Saturday in May" about the Kentucky Derby. Made by the New York born-on-the-track Hennegan Brothers, the film whirls you through the excitement surrounding two Kentucky Derby winners and includes a great deal of previously unseen footage of our ill-fated friend Barbaro at New Bolton Center. But it's mainly about the horses and people who make the Kentucky Derby such an unforgettable event, one that we look forward to each year because it is strong enough to endure and capture our hearts, year after year. We may forget who won, but we never forget the thrill. And this film is full of thrills, colorful characters (maybe you're in it!) and of course, the horses on whose hooves the hopes of the horse world run. Here's a list of the cities hosting premieres: Atlanta, Austin, Berkeley, Boston (you bet I'll be there! ), Chicago, Cleveland, Columbus, Denver, Detroit, Indianapolis, Lexington, Louisville, Los Angeles, Milwaukee, Minneapolis, New York City, Philadelphia, San Diego, San Francisco, Saratoga, Seattle, St. Louis and Washington DC. The Grayson Jockey Club Foundation for equine research (including laminitis) will be the charity beneficiary of the opening night festivities. The official premiere was in Louisville this past weekend, with a press screening in Manhattan, and there's also a special showing next week in Saratoga. So far, the film has gotten great reviews. This one's about the world we live in, on the best day of the year. It's about the horse world that the public needs to believe in if horse sports, especially racing, are to survive. There's a big wonderful web site about the film here. And some amazing raw out-takes of Barbaro here. A great way to celebrate finishing your taxes! Greetings from the Gluegrass: Will Big Brown and Pyro Choices of Designer Footwear Turn It Into the Ken-STUCK-y Derby? Glue-on horseshoes are the stuff of legend this year as at least two of the Derby favorites flaunt their footwear on the road to the Triple Crown. In the Southeast corner, we have Big Brown, winner of the Florida Derby by a landslide in spite of recovering from heel wall separations in both front feet. The photo (bottom of this post) shows a typical injury of this type, usually caused by a subsolar abscess, trimming too short, or training and racing on hard tracks (or a combination of these factors). Ian McKinlay, the New Jersey quarter crack specialist who repaired the detached wall on the first foot, said that the colt "is not a bad-footed horse" and just needed cushioning on the inside heel where an abscess had been. "Chances are, it will grow down, on both feet, and he'll be fine going into the future," Ian said yesterday. "His trainer knows what he's doing." Ian's solution, which we hope to show on the blog, is a standard one; he says the injury is quite common among both Standardbreds and Thoroughbreds. He cleaned up the wall from the quarter back to the heel and put a gum rubber insert under the deficit. There's one heel nail holding the glued shoe from slipping, along with a copper clip (the PMMA adhesive sticks very well to copper) on the outside. The gum rubber material is like window caulking; it acts like a gasket. The glue-y shoe is a regular race plate. And in Kentucky, all eyes will be on Pyro in the Bluegrass Stakes today. I didn't know until this week that Pyro won the Risen Star and Louisiana Derby wearing Curtis Burns' Polyflex all-urethane shoes, and he will apparently have them on today, as well,to run on Keeneland's Polytrack. Pyro's gluesmith is Steve Asmussen's regular horseshoer, David Hinton. What's in a name? Polytrack seems to agree with Polyflex; you'll agree if you watched Kiaran McLaughlin's trainee Little Belle win the Ashland Stakes at Keeneland last Saturday, with Curtis's see-through shoes glued on her fast little feet. And who gets the last word in this sticky story? That maven of the media, 2007 Belmont Stakes winner Rags to Riches. It seems R2R, who now resides at Ashford Stud in Versailles, Kentucky, was bred to Giant's Causeway last week. To celebrate her future marehood, farrier Steve Norman pulled her raceplates and replaced them with glueons which will stay on for a cycle or two. This is called "transitional shoeing" and is meant to encourage sole growth before she goes barefoot. 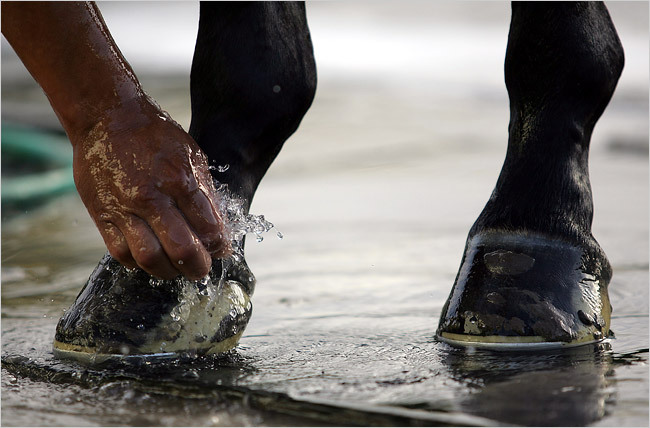 Traditionally, fillies and mares coming from the track have their shoes yanked off and they go straight to a barefoot lifestyle. This usually means gimping around the breeding farm for a number of weeks, since the feet are often cut quite short at the track, and the soles can be thin, until the feet toughen up. One horse who I cannot imagine in gimp-mode is Rags to Riches. 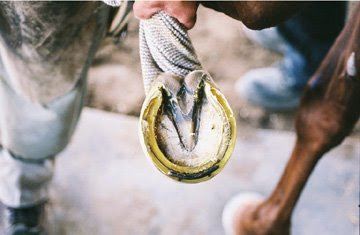 Note: There are special shoes for gluing on racehorses, such as the Polyflex shoes or Sigafoos shoes, with cloth cuffs. 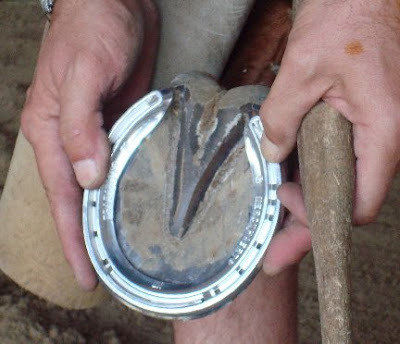 Farriers can also glue on or glue-and-nail normal plates or shoes. There are some amazingly creative people working on these horses. Thanks to all the farriers and trainers who contributed to this and other posts. I know they had a lot to do this week but most took the time to talk because these new shoes are past the "experimental" stage and are now considered creative equipment adjustments. We've come a long way. In this fun video, you can watch Big Brown gallop nimbly around the track at Gulfstream Park, winning the 2008 Florida Derby in near-record time last week while wearing glue-on shoes to help his front feet, both of which have suffered painful wall separations. What could he have done that day if he was 100 percent? Listen closely to the altered-lyrics of this familiar Jim Croce song; glue-on shoes are having their praises sung! 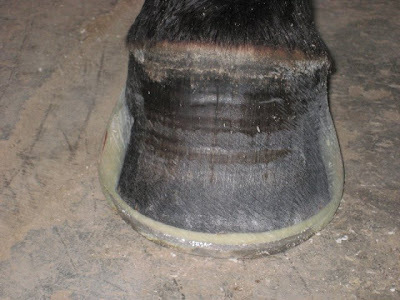 In an interview today with Hoofcare and Lameness Journal editor Fran Jurga, trainer Richard Dutrow shared some insights into the hoof problems that have been in the headlines lately. If his horse Big Brown, owned by IEAH Stables Inc., can win the Florida Derby in near-record time from the outside post position with two hoof wall separations and special shoes glued on his feet, what might this horse be able to do if he was sound? Dutrow said that when he arrived at his barn, Big Brown already had suffered one quarter crack, or wall separation, which was repaired in New York by hoof repair specialist Ian McKinlay. Later, the horse developed a second separation, in his “good” foot, after being shipped to Florida. 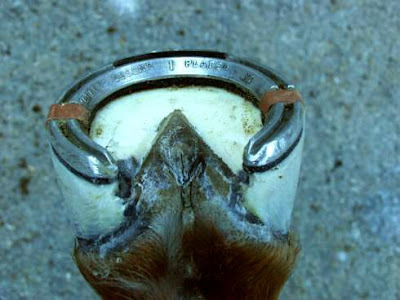 This repair was handled by Tom Curl, a Florida-based hoof problem specialist who works with Ian McKinlay. Among the horses on Curl’s resume are Belmont Stakes winner Touch Gold and famed leading money-earner Cigar. He also helped Afleet continue his racing career as he ran in stakes races with the first glue-on race plates back in the mid-1980s. Dutrow consulted his calendar and said that it has been 40 days since Curl repaired the second foot. He said the first one is all but “history”, but on the second (newer) one, the problem is still visible above the glue holding on the shoe. On his hind feet, Big Brown wears normal shoes, but with turndowns. A turndown is an exaggerated heel calk, formed by twisting the heel of the shoe toward the ground like a spike. Turndowns are not allowed in New York. Big Brown will not be in the spotlight at Churchill Downs and Keeneland, where most of the other Kentucky Derby candidates are training. Dutrow said that Big Brown will stay in training at Palm Meadows in Florida, almost right up until the Kentucky Derby. He will fly to Louisville on the 28th of April, according to Dutrow’s current plans. The Kentucky Derby will be run on May 3rd. Please click here to learn more about quarter cracks and see a short video from Big Brown's consulting specialist Ian McKinley of a horse with a quarter crack. Note: Most of the information published so far on Big Brown's glue-on shoes are about their very high cost. I am not sure how or why that information was given to the racing press, or if it is correct and whether or not that price included the patching, which is an involved procedure. There are many expenses involved in treating a complex wall separaton or crack and in gluing on special shoes. What matters is what the care and shoeing and patching allowed the horse to do. I hope to have more details about the shoes to post shortly. After posting on Friday about the footing at the Winter Equestrian Festival in Wellington, Florida, I have a few more comments to add. I think this is the year of the surface: whether its show arenas, home schooling rings, or racetracks, everyone is talking about (and obsessing over) footing! No matter whom I'm with, the subject invariably comes around to it. And no, I don't know about much new research! One vet said that he thought he had seen more bruised feet this season at Wellington but seemed genuinely pleased overall with the footing. Show circuit farrier Jack Miller, who happened to cross my path at the airport this afternoon, concurred with the veterinarians' comments. We sat down to chat for a few minutes. He said that the new footing was much more consistent and enabled the show to go on, even after a downpour of six inches of rain. "The new footing was great," he said, "but a little sluggish. The horses were maybe jumping an extra two inches, because they were sinking in. It stopped them. And it cupped a lot out of the bottom of the feet. But it was a lot better than it has been, and they didn't have to use as many studs. We didn't see too many 'Spruce Meadows Specials' (supersized studs) this time." Also at the airport today, I ran into another vet, Dr. Liz Maloney from here in Massachusetts, who has been flying back and forth to Palm Beach all winter to compete her horses in the amateur owner division at the WEF. She said that her horses, who are shod by "banana shoes" expert Danny Dunson from Tennessee, handled life on the showgrounds very well, although she didn't always compete in the newly renovated "Hong Kong footing" arenas. She said it was great to not to have to use studs, since she worries so much about the injuries they can cause. "It feels hard when you land, but it's not, really," she said of her impression from the saddle. Other comments I heard were about the hunter ponies that compete barefoot and wore booties to get from the stable area to the arena and schooling rings, since the pathways were crushed stone. Show hunters want as little knee action on the flat as possible so no shoe or the very lightest aluminum shoe is usually the answer for them. Everyone seemed pleased that the winter season in Wellington was unaffected by disease (EHV closed the showgrounds last year in the weeks before the show started) or disaster (hurricanes have been a threat the past few years) and that the upper echelons of the hunter/jumper/dressage showing scenes seem (so far) unaffected by financial woes troubling other sectors of the US economy. Thanks to the Winter Equestrian Festival and Kenneth Braddick of Horse Sport USA for the excellent photos and reports shared with this blog all season. Now it's time to pack up and move on. See you next year! I should be thinking about the bright blue sky overhead, but this post is about the ground beneath our feet, instead. The fabulous Winter Equestrian Festival has melted into spring and the newly-renovated arenas at the Palm Beach Equestrian Center have endured thousands upon thousands of hoofprints. The WEF's signature green grass of past years is a memory. And now it's time for two of the circuit's veterinarians to update us on how the footing worked for the horses this winter. Dr. Timothy Ober, veterinarian for the U.S. Equestrian Team and a member of the U.S. Equestrian Federation Equine Drugs & Medications Committee, said, "We have no statistics as such, but it seems there are fewer injuries. The horses are holding up better." Dr. Scott Swerdlin, president of the Palm Beach Equine Clinic, the official veterinary service for WEF, said: "There are fewer catastrophic injuries. Aa result, the veterinary community is excited about the new footing which has been spectacular." The vets gave their opinions as the CN Winter Equestrian Festival presented by Zimmerman Advertising wound up 12 weeks of competition that began on January 16. Footing created by Bart Poels, the 2008 Olympic equestrian footing expert, and installed by Poels and Brett Raflowitz of Palm City, Florida, was installed in the two jumping Grand Prix arenas at Palm Beach International Equestrian Center. In the centerpiece International Arena alone, more than 7,100 "trips" (not including jumpoffs) were completed by hunters and jumpers during WEF. A four-day dressage competition required that two dressage arenas be installed in the International Arena. Thousands more horses competed in the Bertelan DeNemethy Arena in which the "Poels" footing was also installed, as well as several other competition and warm up rings, including the Grand Hunter and Rost arenas and Ring 6. Equestrian Sport Productions, LLC, the PBIEC management company, announced that the "Poels" footing will be installed in the Mogavero ring over the summer. Before the start of WEF, ESP placed the highest priority on improvements in the footing throughout PBIEC to enhance the safety and welfare of horses. Among the events held in the International Arena was the five Selection Trials for the short list for 2008 Olympic jumping team. And the show grounds were inundated by record rain fall during the course of WEF. Dr. Ober, who attended the U.S. equine athletes at the 2004 Olympics in Athens, the 2006 World Equestrian Games, and dozens of the other international competitions, said: "Horses in the trials were in good order. That is an example of how the footing has been beneficial. Compared to past trials, the attrition rate seemed smaller and that primarily is due to the footing. "There was a little bit of a learning curve with the new footing. The type of footing requires an adjustment because it does not allow the foot to glide. "The footing has been a real positive, mostly for the good of the horses that always come first. But without it, because of the weather, there might not have been the competitions we were able to have." Thanks to Kenneth Braddick of the Winter Equestrian Festival for help with this report. Here's the fabulous Gould and Sons Forge in Merrow, England in 1913, just before the outbreak of World War I. I'm not sure what's more impressive, the horseshoe-shaped doorway to the forge or the topiary cottage next door! Does it have an arch as well? Fast forward 15 years: Here you see the same forge in 1927. Where did the horses go? The doorway is still there but they've added gas pumps--and look at that car! Note that the cottage seems even more buried under foliage. And the fellows aren't wearing aprons. Like so many others, I have a "thing" for these old forges with arched "horseshoe" portals and would love to know which ones are still standing. I know the one near Waterford, Ireland (now a tearoom) is still there--are there others? What became of this one in Merrow, England? Please email fran@hoofcare.com if you have any information about old forges or farrier-related architecture. Thank you!